Thank you Katrin for the idea to have your dog go UNDER your legs to try and get the Frog position 🙂 I’m going to try that tomorrow… Cosi is doing well with the first 4 tasks, but we are having a slow time to get both legs out for Frog… I also have a “duration” question. Is it OK to get some duration for the box and plate tricks by counting? Example: saying quietly “1-2-3-4-5-6-7-8-9-10 -- OK!” Thanks so much to Silvia and everyone in this class for the helpful videos and comments -- Cosi and I are learning a lot in this format and having a lot of fun too! Yes, I guess the counting gets the role of “keep going” signal. Once the dog gets the concept, it can make adding duration easier yes, so yes, that’s another concept you can introduce with those tricks. You are re welcome, Cindy! Here are videos of Blast doing #4. The cardboard box was his second attempt and the red box was his third. I almost wish he would move slower. The quickness in his motions is going to make a smaller box hard to stay steady. Very cute. I think an energetic dog is much for fun than one that is not. They will give you lots of behaviors to choose from. And they teach you to be quick too. =) For sure your pup is having lots of fun. It does! 🙂 Great box work, almost there already! Very nice bottle hold too, we’ll get to that one too 🙂 For the frog, you need even more feet extension of feet back. Maybe you can do that close enough to a sofa that she can reach it with hind feet and then click for touching it and maybe pushing off of it. That will make her extend even more. How are the other tasks going? Thanks Silvia! I will try setting her up so she can stretch her hind legs & touch something with her hind feet. Should I continue to work with her on her side for this? The “frog” is a difficult one for her--I have never seen her do this naturally. The other homework is going very well. 1. Recalls--getting quick head spin turns back to me. Even left a ball (her favorite) to drive back to me. 2. Plate--she knows this one very well as we have done a lot of pivot work. 3. Ignoring food or toy--we have been working on ignoring toys. She would get a bit “over the top” if I had a toy--jumping & grabbing. So we worked on me first holding the toy & clicking for eye contact & rewarding with tugging or throwing the toy/ball, and then I started moving the toy around or rolling the ball and waiting for eye contact (this was hard for her at first). And now I can even drape a tug toy over her nose & she just sits & continues to give me eye contact until I say “get it” and then we have a great game of tug. Big improvement here! Sounds great! And yes, keep working on a frog from this position. When you have good extension and understanding of it in that position, try it in half-side position (front feet in normal position, hind feet turned to the side, so that she is lying on one hip -- hope that makes sense), down position is the hardest. Bean and I have been having a blast with this lesson. #1: Recalls -- good with moderate distration. Hopeless right now chasing around with our Aussie 🙂 We are working on it. #2: Plate: She is putting front feet on plate pretty well. She gets all geared up and starts squeaking, snorting, snuffling and a bit frantic at which time she will pop her rear feet on the plate. I think this is so funny I wind up clicking and rewarding. Not sure if this is a good idea -- or what I should do. #3 Food on floor: she is pretty good leaving it. #5: Froggy Legs: At first she would push one leg back and then the other, so I rewarded her for each not knowing whether she would ever be able to do both at the same time. She started going back and forth quicker and then popped both of her legs back. Now she seems to love doing Froggy Legs! Here is a short video of where we are with things this weekend. Thanks for everyone’s videos -- I am learning so much from everyone! That is SO cute that she (girl correct?) offers the “frog” when frustrated with the small object. LOVE Bean’s frog!!!! SO cute!!! GREAT! What a cute, hard working dog! Her froggy legs are just too funny! Loved her ideas of what else she could do too, I often can’t help but reward it too, but I usually simply “reward for cuteness” and don’t click it if I don’t really want to go in that direction. But those hind feet on the plate are really impressive, great hind feet awareness, she thinks front feet on are too easy! For 4in, can you find something of the size in between the box and the bowl? She doesn’t seem to recognize it’s the same thing as she is not even trying putting hind feet in/close/up. You could try with a smaller box, but still a box. If you don’t have anything appropriate, put something in the box to limit the space she has in there. Once she can fit all 4 feet in a space, equivalent to bowl size, put a bowl in a box first to help her succeed and then try again with just the bowl, I think that will do the trick. She sure looks to have lots of fun, what an enthusiastic dog! Oh my gosh! Bean’s frog is awesome!!!!!! I know you, Diane. Your border collie is very cute. I am the Dianne with 2 “n’s” who has the white mini-poodle, Punch. I am taking this course with my new mini poodle puppy, Boom. He just turned 4 mo. I will be downloading soon…having some computer/video user challenged problems but I’m learning. Looking forward to getting back to New England first week of May. Hi Dianne -- Congrats on your new puppy! Good to see you here -- and looking forward to seeing you soon in New Englane! I dream of a frog like that!!! 😉 Great job! Great dog! I am so enjoying working with Tili and learning how her little 11 week old brain works -- everything is so new and exciting. Thank you everyone for your video’s they are so useful -- I am having a technical hitch with my video’s but will post when I sort it out. 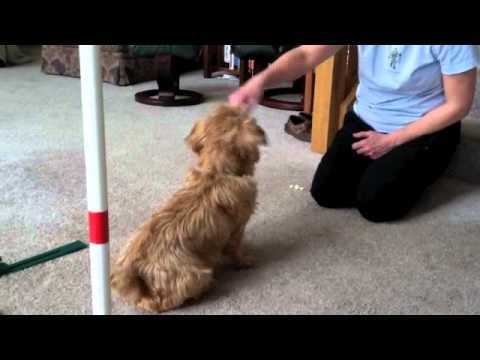 Tossing food and adding in tug sessions has really helped keep her involved with me. She is now taking dry kibble with a few meaty bits mixed in which is far less messy. Very pleased with recalls, Tili is calling out of my pack on walks and did lovely restrained recalls at her puppy socialisation class yesterday and called out of play with the other pups -- used a mixture of very high value rewards and tug play to get this. Feet on the plate -- she gets her front paws on almost as soon as the plate goes on the ground, she is giving a little bit of movement which I have been clicking. Leaving food and toy fairly reliably but needs the odd reminder -- getting better. Steps into the box, we have now down sized slightly and it takes her a little while to collect her hind feet in but that was improving at the end of the session this morning. Frog legs is still a work in progress -- using a mixture of capture, shaping and a bit of luring. Tried a cushion to get the frog position and got some vigorous digging action so am trying to put that on cue. Wow, that sounds great for 11 week old puppy! Very happy that she is getting interested in kibble too and well, mixing in play is very important to keep young puppies focused anyway. For a frog, you can see many different approaches in videos of others, you can try several and see what works best for you. And she never does it naturally? Stepping into the box -- the first box shown is the 2nd box I used and I show the start of the 3rd box, but wonder if it would not be better to be using something round with a lower side? 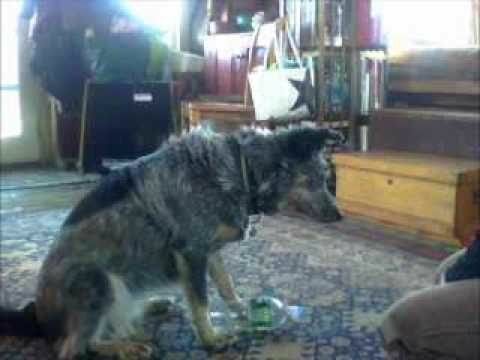 Great, very smart puppy! It was too funny when she started to pick up hind legs when on a plate, thinking it could be the same trick as 4in. Your box seems o.k., the best is to use a variety of different objects and shapes to help then learn to generalize. Sorry first two attempts at getting the video up I had finger trouble with the address. The treats I was using were a bit chewy which delayed clicking. I came across an interesting problem when working on item #4, four feet in the box. We were using a box to train Silvia’s heeling method, so I previously taught both my pups to put their front feet ONLY in the box, and to circle their back feet around the box. So, when I pulled out the box to do #4, this was the behavior they offered. I realized that this could be rather confusing and unfair, so I put the box away, and took out a laundry basket. Sort of like a box, but bigger, easier to get all four feet into it, and looks different. At first, my boy tried to offer his front feet/back feet circling behavior. I didn’t reward it, because I wanted to make sure I differentiated — let him know we’re working on something else. This time (unlike with the box), he moved on to offering all four feet in the box very quickly (within a few seconds), and I gave him a huge jackpot for that. So he was able to understand pretty quickly that it was a different exercise. Next, I moved him back to a cardboard box (a different one than the one we had used for the heeling exercise). He tried the circling again, but moved to all four feet in within seconds again (I think he understood it was a new game). 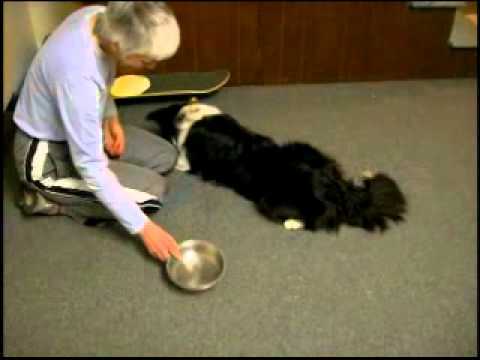 Next I want to work on smaller objects again, but using box of different materials, or maybe already go to a larger bowl/bucket, so that it is clearly a different object than the one we use for his heeling trick. Any ideas on how to make this even easier to differentiate? But anyway, to make it easier, you could, for example, always stand up for perch work and always sit down for 4in. Yeah — I started the perch work with front feet up on a little stepping stool, and then went to the box when trying to flatten it out (starting to fade it). I tried a piece of white paper as the flat object, but it kept moving, so the cardboard seemed like it would be heavier and stay in one spot. Just now when writing back to you, I realized that I could try a mousepad instead of the white paper so it won’t move — gotta try that tomorrow! I am sitting down for the 4in work, so hopefully that will also help differentiate. Thanks so much!! Oh, o.k., no problem, they can still learn 4in, don’t worry if they’re a little bit confused.